Infect your game with this brand new Designer Booster Pack designed by father-and-daughter team Matt and Colleen Leacock! Make your copy of Blank unique, and be inspired in brand new ways as you try to save the world! 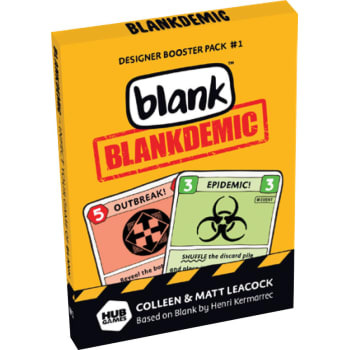 Combine this brand new Designer Booster Pack with a fresh copy of Blank, or mix it with a copy you already own! The game basics remain the same - play cards matching colors and numbers until you get rid of all the cards in your hand - but now theres a Blankdemic-flavored twist! Brand new ways to win the game have been designed by Matt and Colleen, and new Role Cards will give you special advantages to beat your opponents. There are new keywords, Display cards, Epidemics and even Legacy elements in this brand new expansion - and everything will inspire you to create a whole new way to play your favorite card game!